Spain's prime minister has accused the Basque separatist group, Eta, of trying to upset Sunday's election by murdering a former Socialist Party councillor. 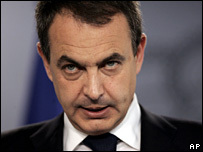 Jose Luis Rodriguez Zapatero said "terrorists wanted to interfere in the peaceful manifestation of the will of the people" by killing Isaias Carrasco. The 42-year-old was shot dead near his home in the Basque town of Mondragon. 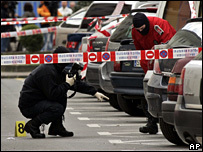 Eta, which ended a 15-month ceasefire in June 2007 after failed peace talks, has carried out similar attacks before. Earlier, the main political parties called a halt to their last day of campaigning ahead of the general election after news of the killing emerged. Mr Carrasco, who was a Socialist candidate in municipal elections in 2007, was shot at least three times in the back of the neck, head and chest as he left his home in Mondragon. Witnesses said the gunman, wearing a false beard, had fired at close range before fleeing the scene in a grey car. Police said Mr Carrasco's wife and young daughter rushed out of the house after hearing the gunshots and alerted the authorities. He died later in hospital. "I looked out of the window and I saw his wife and daughter on top of him shouting 'murderers, murderers'. His chest was covered with blood and they had got blood on them too," a woman told the Spanish television station CNN+. After the shooting the ruling, Prime Minister Zapatero, who leads the ruling Socialist Party, cut short a campaign tour of the southern city of Malaga and flew back to the capital, Madrid, vowing to use every means to hunt down the killers. "We knew that Eta could still cause irreparable damage and pain to Spaniards," he said in a televised address. "Today they have added another victim to their long and ignominious list." But Mr Zapatero insisted Mr Carrasco's murder would not have any effect on the outcome of Sunday's election, which the Socialists are expected to win. "The terrorists wanted to interfere today in the peaceful manifestation of the will of the people at the ballot box," he said in a televised address. Mr Zapatero, who is seeking to win a second term in office, broke off peace talks with Eta in December 2006, after two people died in a bombing by the group at the Madrid airport car park. Four years ago, the Socialists benefited from a late surge in support in the wake of the Madrid train bombings, which killed 191 people. That attack, which was initially blamed on Eta, was in fact the work of Islamist extremists. For more than three decades Eta has waged a bloody campaign for independence for the seven regions in northern Spain and south-west France that Basque separatists claim as their own. Euskadi Ta Azkatasuna, the group's full name, stands for Basque Homeland and Freedom. It first emerged in the 1960s as a student resistance movement bitterly opposed to General Franco's repressive military dictatorship, under which the distinctive Basque culture was suppressed. Eta's violent campaign has led to more than 800 deaths, many of them members of the Guardia Civil, Spain's national police force, and both local and national politicians who are opposed to Eta's separatist demands.